What a place to break your journey. Sunrise over the mountains. Simply awe-inspiring. 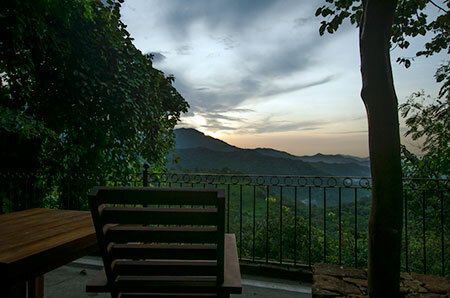 Ella Jungle Inn offers personalized accommodation with a beautiful mountain view of Ella. Wi-Fi is available in public areas. Dine at the outdoor or indoor restaurant and admire the stars over a candle-lit dinner. The restaurant caters to 60 … for a meal or tea break during the tour from hill country to the beach. Our Tree House is built on stilts and gives you an elevated view of the valley over the tree tops. As far as kids are concerned, tree houses capture their wild imaginations. They provide shelter but also provide a respite from adults and an adult-sized world. It’s really the ultimate when it comes to letting the nature in.